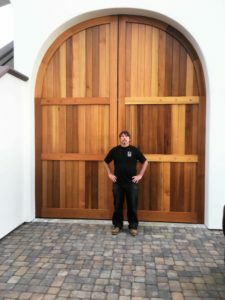 For more than a quarter of a century, Williams Gate Works has crafted beautiful custom wood gates for both residential and commercial clients in San Jose. Redwood is the ideal wood for driveway, backyard, side yard, or garden and fence gates, giving you easy access to various areas of your property while increasing curb appeal. Our entrance solutions incorporate solid wood with bronze hardware and fittings that help set your wooden gate apart, regardless of where its used. You may be a business owner with a fenced area in need of a new gateway, or perhaps you are in the process of fencing a portion of the property in. Homeowners often have to put up a fence around gardens in an effort to keep pets and wildlife out. Maybe your backyard gate has seen better days, is worn, and need of replacement. No matter what your need, we provide elegant, customized solutions. Most home supply or fence companies have very few options when it comes to entrance solutions. A steel or aluminum gate is common, but redwood or other solid wood entrance solutions are far more attractive, and complement the exterior of your home or business in a way that traditional gates simply cannot accomplish. In addition, we design our wooden side, backyard, garden, and fence gates in a way that prevents warping, cracking, splitting, and other issues commonly found with wood. Custom redwood gates are our specialty at Williams Gate Works, and what we do best. When you choose our entrance solutions, you can rely on a quality, visually appealing gateway that will last a lifetime! We serve the greater San Jose Area including Palo Alto and Los Gatos. Contact us today to learn more about our process, and our promise to you.